Abstract. Various methods of document alteration with the aim of evidence falsification occur in legal practice, including light exposure, heat exposure, chemical exposure. To detect characteristics of document exposure to heat and/or light, authors of this paper developed method of detection of document artificial aging evidence. Keywords: forensic document examination, detection of document artificial aging characteristics, document heat exposure, optical brightener fluorescence signal. Optical brighteners based on stilbene derivatives [1, с. 296], are used to whiten office paper. Brighteners are added to paper pulp in small amounts (0.01%-0.1%). Molecules of these dyes absorb light in near-UV spectrum range and fluoresce radiating in the range of about 400-500 nm creating the whitening effect making up for radiation in this spectral range that is absorbed by cellulose lignin. Chemical composition and applied bleach concentration varies between different paper manufacturers and even between different batches by same manufacturer. These differences are observed when registering band of fluorescence excited by UV light sources. When exposing paper surface to shortwave light radiation and heat, dye degradation and fluorescence intensity decrease occurs leading to surface yellowing. Application of artificial aging methods without specialized equipment that provides highly uniform of light or heat field leads to noticeable scatter of fluorescence magnitude of different surface areas of paper sheet. Visual review and/or sheet photography while lighting sheets with near-UV light and point control along with statistical analysis of fluorescence signal of different regions of paper sheet are used to detect such irregularities. To find out whether the documents were subjected to deliberate exposure that can impede dating of handwritten text and stamp impressions, distribution of optical brightener fluorescence signal when excited by UV radiation is researched in vicinity of band peak at 440 nm wavelength (Fig 1). Fluorescence is excited locally on the paper sheet region 4mm in diameter by UV LED T9H28C (SEOUL SEMICONDUCTOR) with a wavelength of 280 nm. Fluorescence radiation is transferred to ZMR-3 monochromator entrance slit through the optic fiber and is gathered from the exit slit to FEU-100 photomultiplier photocathode. Signal of photomultiplier is recorded after the U5-10 dc amplifier. Signal is registered in the points uniformly distributed along sheet reverse side and non-inked regions of a front side of the sheet. Level of fluorescence signal of optical brightener for samples of office paper made by different manufacturers lies in the range of 200-700 relative units. Optical brightener fluorescence signal scatter over the A4 sheet surface for fresh paper and documents, that weren’t subjected to artificial aging is typically less than 5% at triple standard deviation which corresponds to 99,7% confidence interval. Signal distribution function for paper that was subjected to artificial aging, has a widening of more than 20% compared to normal distribution, and is splitting into two strata (Fig 2). Figure 3 shows histograms of signal distribution of optical brightener fluorescence for documents that weren’t aged artificially. Significant decrease of optical brightener fluorescence signal on one side is typical for papers that were kept under artificial light for a long time (several years) or subjected to intense and uniform light exposure leading to optical brightener photodegradation with the aim of artificial aging. For the papers that were preserved in stacks, packs, folders signal difference between two sides is less than 5% and typically lies in 1-2% range according to this research. 1. Safonov V.V. 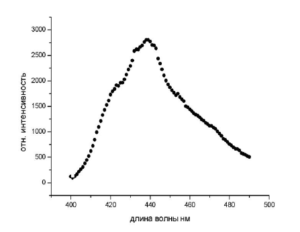 Photochemistry of polymers and dyes / V. V. Safonov. – SPb: Fundamentals and Technologies, 2014. – 296 p.
2. E.N. Borisov, V.A. Kochemirovskiy, A.S. Tver’yanovich, G.A.. Zhuravleva. Laser-fluorescent method of detecting evidence of documents artificial aging / E.N. Borisov// Forensic analysis in the present context, future development and specialist training»/ SPb NPO «Sudex». – 2012.